The Taklimakan desert is one of the driest, most barren expanses on Earth. Flanked by mountain ranges on three sides and parched by the resulting rain shadow, parts of the Tarim Basin receive no more than 10 millimeters (0.4 inches) of rain per year. It is no surprise that plant life is scarce. With little vegetation to hold sand in place, some 85 percent of the Taklimakan consists of shifting sand dunes. Only the dune fields of Saudi Arabia’s Rub’ al Khali cover a larger area. Taklimakan’s dunes can soar up 200 to 300 meters (650 to 900 feet). With so much sand and so little vegetation or moisture, dust storms are a regular occurrence, particularly in the spring. 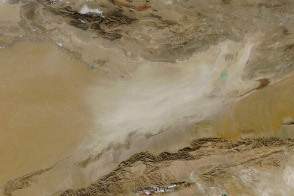 On May 1, 2016, the Visible Infrared Imaging Radiometer Suite (VIIRS) on the Suomi NPP satellite captured this natural-color image of northeasterly winds pushing a wall of dust southwest across the Tarim Basin. The Tarim Basin is bordered by the Kunlun Shan mountains to the south and the Tian Shan mountains to the north. 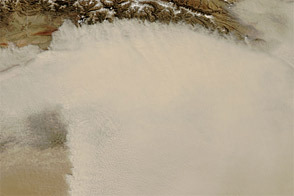 (The Tian Shan is covered with snow and partly obscured by clouds in this image.) 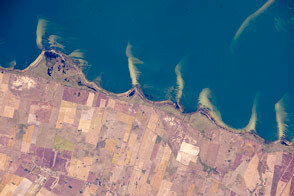 The basin opens up on its eastern edge, but that is not generally a way out for dust. 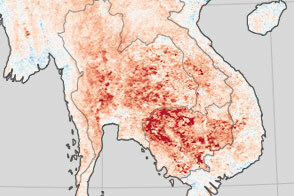 Prevailing low-altitude winds almost always blow from the east, keeping most dust below 5 kilometers (3 miles)—about the height of the mountain ranges—and trapped within the basin. 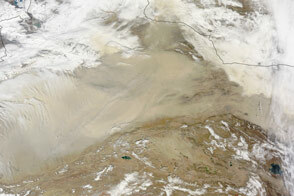 In spring, strong surface winds can sometimes lift dust up to 10 kilometers (6 miles). These particles can then be transported by higher-altitude winds that send them across China and the Pacific. 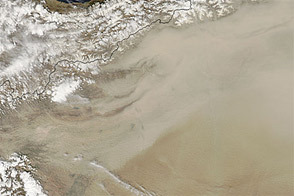 In this case, however, the dust appears to be relatively low in the atmosphere. 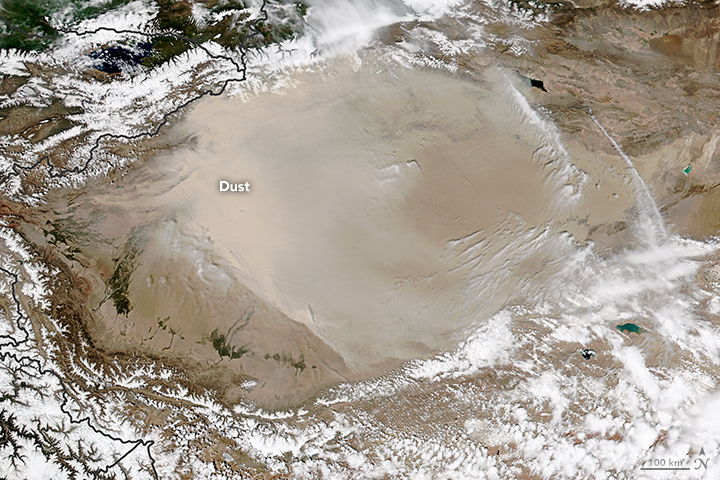 Dust storms can lead to public health problems in populated areas downwind by transporting small particles, bacteria, and viruses that infiltrate human respiratory systems. Dust storms also affect Earth’s climate by scattering and absorbing incoming solar radiation and changing the properties of clouds. 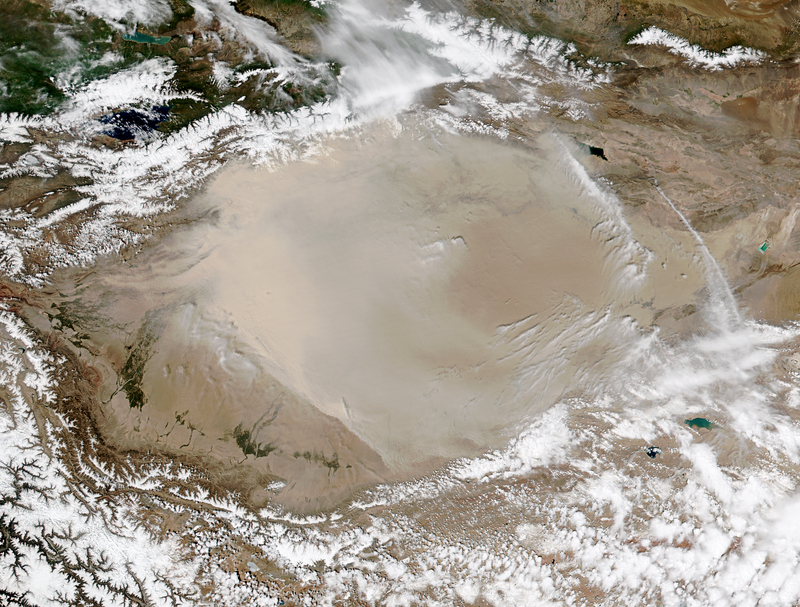 Huge dust storms regularly blow across the arid Tarim Basin in western China. Ge, J. M. et al. (2014, October 28) Characteristics of Taklimakan dust emission and distribution: A satellite and reanalysis field perspective. Journal of Geophysical Research: Atmospheres, 119 (20), 11,772-11,783.